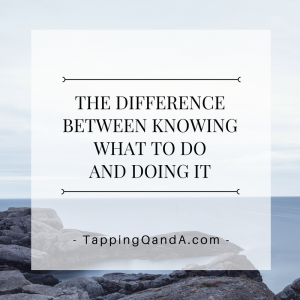 There is a huge difference between knowing what to do and actually doing it. Just because tapping is a powerful tool doesn’t mean that you will always remember to reach for it in times of emotional distress. When my clients are recounting something from the previous week that was hard, I ask them if they tried tapping for the issue. They usually reply somewhat sheepishly, “No… I forgot.” My aim is not to try to shame them by asking that question. I just want to know what happened so we can do the best work in the moment. We set amazingly high standards for ourselves. Part of us believes that if we know how to do something, then we must be perfect at it every time. That is simply not the case. It takes time for new skills to become a habit. But we are human beings and we simply aren’t perfect, meaning that we don’t always reach for the right tool. Below you will find a tap-along audio and tapping script to help you to be easier with yourself when you aren’t doing the action you want to take perfectly. When tapping like this we are not excusing ourselves from not making the best choices, but instead making sure that we understand why we don’t always make the best choices. Right now, think of an area in your life where you are beating yourself up because you aren’t doing it well enough, and tap for it. Not only will you feel better, but it will be easier to take positive action. I recognize the fact that I am not perfect…I recognize the fact that I will make mistakes…Even though I can intellectually accept that fact…There is a part of me that does not want to accept that…There is a part of me that thinks I need to get it right…Especially when I have the skills…Especially when I know what to do…When I don’t use the skills that I have…There is a part of me that decides to beat myself up…There is a part of me that needs to let me know that I am wrong…There’s a part of me that wants to punish me for this mistake…I appreciate the fact that something in me wants to hold myself to a very high standard…I appreciate the fact that there is a part of me that wants me to make the best choices possible…I also recognize the fact that this part of me is over functioning…That this part works way too hard…That this part believes if it beats me up for making a mistake…I will then make good choices in the future…I know this isn’t the case…I know that harsh words and beating myself up are not helpful…I know chastising myself is not useful…I give myself permission to be easy with myself…I give myself permission to be gentle with myself…I give myself permission to be kind to myself…There’s a part of me that finds this unacceptable…There is a part of me that believes I’m taking the easy way out…There is a part of me that thinks that when I am easy with myself…What I’m really doing is giving myself permission to make more mistakes…But when I’m easy with myself I can still take responsibility for my past choices…When I’m easy with myself I can still take responsibility for the consequences of my choices…When I’m easy with myself I am still deciding to learn the lessons of the past…Learning from my past is useful…Learning from my past is instructive…Beating myself up for bad choices is destructive…I give myself permission to be imperfect…I can be imperfect and still strive to do my best…I give myself permission to be easy with myself…Knowing that being easy with myself is not letting myself off easy…When I learn from my past without beating myself up…It is the fastest route to transformation…It is the fastest way to creating positive new habits.